Eighth-grader Liam Bayne has always liked math and science -- that’s one reason his family sent him to The Alternative School For Math and Science (ASMS). But he was surprised and excited when his sixth-grade science class started each new topic with experimentation, not lecture or textbook learning. “I was really excited because the first thing we did was experiments and hands-on stuff, which is my favorite part,” Liam said. 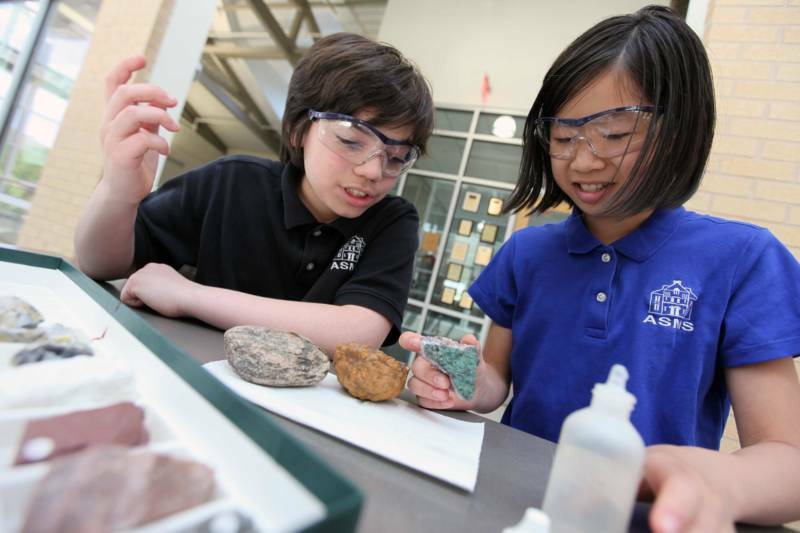 At ASMS the teaching philosophy centers around giving students experiences that pique their interest to know more. Their science curriculum is based on a program called Full Option Science System (FOSS), but has changed over time as teachers bring new ideas to the curriculum and focus on meeting the Next Generation Science Standards (NGSS). This style of learning can feel foreign to many ASMS students at first, whether they come from a private or public elementary school, but with time and support they often come to see its value. Kids talk with one another, and ASMS kids know this isn’t how a lot of friends at other area middle schools are learning. For example, Carolyn clearly remembers an earth science unit about how different sedimentary rocks form, in which she and her partner, Liam, made sedimentary layers of shale, limestone and sandstone. They recreated the geological processes using sand, a sodium silicate solution, clay, plaster of Paris, oyster shells and water, slowly building up sedimentary layers and discussing their structures along the way. Heckle said watching rock formations form crystallized her learning about geology. Both Liam and Carolyn admit group work was one of the hardest things to get used to at this school. But now, three years in, they can see just how much they’ve learned from peers. Liam described a sixth-grade engineering challenge that required student teams to design a spaceship that could pick up items and drop them off at a predetermined distance. No one in his group knew how to start. Liam asked a shy person in the group if they had an idea. The Alternative School for Math and Science started 15 years ago when co-founder Kim Frock was startled at data showing only about half of eighth-grade students in her region, near Corning, New York, were meeting standards in math and English. In contrast, almost all the fifth-grade students were on track, “so it was pretty clear where the system was starting to break down,” she said. The data prompted Frock to start the independent school in a space made available by Corning Incorporated, a global company responsible for inventing products like Pyrex, the gorilla glass on smartphones and the ceramic in a catalytic converter. Corning is a small, rural community with a median income of about $50,000, but Corning Inc. draws many highly educated scientists who want good local schools. Corning donates to its local public schools, but ASMS has a special relationship, getting free facility space and annual funding for financial aid. While the school is private, Frock said it doesn’t use academics to determine admissions and every child’s education is heavily subsidized, although some receive more than others. She also said the school has more kids with special needs than the public schools and draws students from over 10 local districts. “If you want to bring physicists and scientists to the area you have to have a top-notch education,” said Jenna Chervenic, an eighth-grade science teacher at ASMS who used to work at Corning Inc. as a fiber optics mechanical engineer. She left that job to become a high school math teacher, but later joined the ASMS staff. When they started the school, Frock knew they needed to teach science differently. She didn’t think the “canned experiments” many schools do, where students walk through a step-by-step process and get a predetermined result, was a good representation of what real scientists do. It’s too controlled, and doesn’t have enough room for the types of failures and setbacks that professional scientists face everyday. At each grade level students do three big units focusing on Life Science, Earth and Space Science, and Physical Science. At the end of each unit they do an engineering challenge designed to fill gaps in the curriculum and to get students applying what they’ve learned throughout the unit. Teaching this way requires small class sizes and teachers with a deep grasp of their subject matter. The teachers have to be comfortable with students pursuing their own areas of inquiry and guiding them to continue asking questions, iterating, researching and experimenting until they’ve come up with some conclusions. This process was frustrating for Liam and Carolyn at first. Liam was worried people would think he wasn’t smart if he “failed” at something. He’s gradually become comfortable with the idea that when he hits a roadblock in a project, that’s a chance to re-evaluate and try something else. It’s led him to always be asking “why” in everything he learns, whether that’s social studies, earth sciences or chemistry. In addition to science class at each grade level, students are required to complete an independent project or compete in a national science competition. All sixth-graders do a controlled experiment answering a question they’ve designed. Questions range: Does putting food coloring in a muffin change the taste? If I drop different sized balls off a bridge, will the crater size change? It’s a science experiment, but done at school without parental help. And even if students come up with questions the teacher knows they won’t be able to prove, educators let kids pursue the idea anyway. It’s part of the learning process. “If you can create that safe environment where kids are willing to take a risk, they can present a whole experiment, even if they didn’t get an answer or didn't get the answer they were looking for,” Chervenic said. 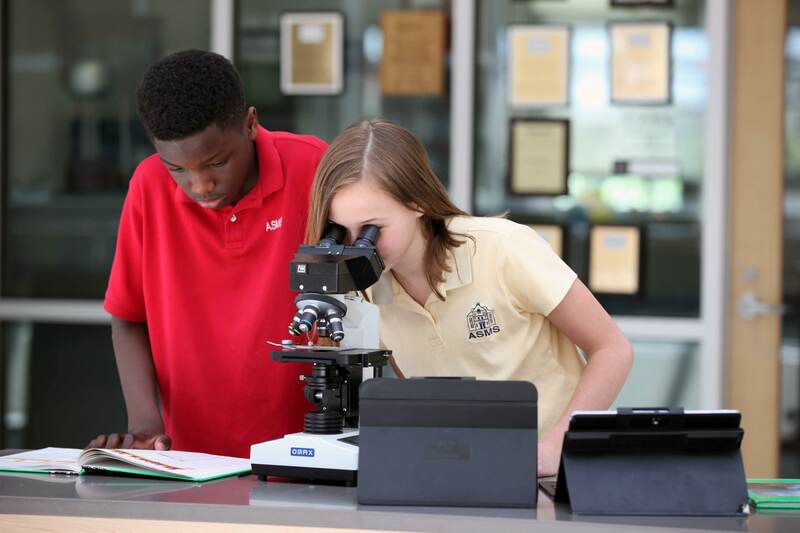 When students get to seventh and eighth grade they have more options to meet their science requirements. They can do another controlled experiment if they want or they can participate in six different national science competitions: First Lego League robotics, Rube Goldberg machines, eCybermission, Exploravision, Future Cities and 3M Young Scientist. “We want kids to be doing the work independently and we want them to be doing the work here,” Frock said. The expectations are high, but teachers want students working through their own problems in a place where they can get just the right support from a teacher. Work on science competitions is almost always collaborative, so staying at school is logistically easier for kids whose homes are spread out across the region. Teachers also encourage students to attend study hall and homework club after school so they can get work done at school before heading home to rest. The collaboration teachers work hard to promote throughout their students’ learning is evident in the adult work at ASMS as well. Teachers regularly visit one another’s classrooms to make sure, for example, that they’re using the same language to talk about an algebraic concept in science as they are in math class. If the English teacher notices students are weak on their writing, then in science class they may also spend extra time writing strong conclusions. Teachers here recognize that without all school disciplines working together, students won’t become well-rounded or see how big questions in life are interconnected. After three years at ASMS, most students have gotten good at solving their problems independently and collaborating in groups. Many have discovered a deep love for science and a desire to know much more about why the world works the way it does. And then most go off to the public high school where class sizes are bigger, some teachers are more traditional, and they take regular tests and receive grades. It’s very different from ASMS and it can be a shock. “The feedback we got was that they weren’t prepared to take tests and do notetaking all year long,” Frock said. These insights came out of a survey Frock conducted with early graduates. To rectify those holes, eighth-graders now spend the last trimester learning some basics about how other schools work. They practice opening a locker, discuss how to advocate for themselves to teachers, and take practice tests. They even read class syllabi together and play around with a mock gradebook to understand how grades are weighted and what scores on different items on the syllabus could do to a final grade. She says grades and tests are different from her learning experience at ASMS but not necessarily bad, and the transition class helped her know what to expect. She says she knows who she is as a student now, and feels comfortable asking for what she needs. On some assignments she’ll stick to the rubric, but on others, when she’s passionate about something, she goes above and beyond. She recently built a scale model of the Globe Theatre, an idea her teacher was skeptical she could complete in time, instead of presenting a slideshow about Shakespeare like many of her classmates. “The project work that was very interesting and engaging helped me in the long run because it got me engaged in middle school so enjoying learning in high school is easier,” Gracie said about the transition from ASMS to high school. And she learned valuable lessons about collaboration there, something that was hard for her, since she often prefers to work individually. Kim Frock, co-founder of ASMS, is proud that over 70 percent of kids who went to ASMS have gone on to pursue college degrees in science, technology, engineering and math (STEM) degrees. And, she says, that’s not because they are screening for 10-year-olds who already know they want to be scientists or mathematicians. In fact, many students come in hating the sciences, but they leave excited about them. To her, that’s proof that the learning experience students get in middle school at ASMS is sticking with them, making an impact well beyond the three years students spend in her building. She knows that a private school like ASMS, with financial support from Corning Inc., gives her freedom to offer exactly the kind of education she believes all kids need, and to do so for families from diverse socioeconomic backgrounds. But she also thinks middle school is such a crucial time to get students excited as learners that other schools can learn from the success they’ve had. “We’ve known how to do education right for probably 40 years, but there are very few schools that have been able to implement it,” Frock said. For her, it starts with hiring teachers that share a particular education philosophy. "In order to teach here, our teachers really have to believe that every kid can be successful,” Frock said. “And I would say that’s not the attitude I’ve seen from every public school educator."